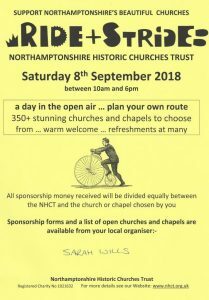 The annual ‘Ride and Stride’ takes place on Saturday 8th September. The church will be open to visitors arriving by bike, car or on foot. Please do record your visit on the form provided in the church. Weary travellers will also be able to receive sustenance at Carry and Gordon’s Open Studios signposted across the field. Please see the Open Studios post for more info.